The Autumn Art School is fully booked. Subscriptions are closed now. 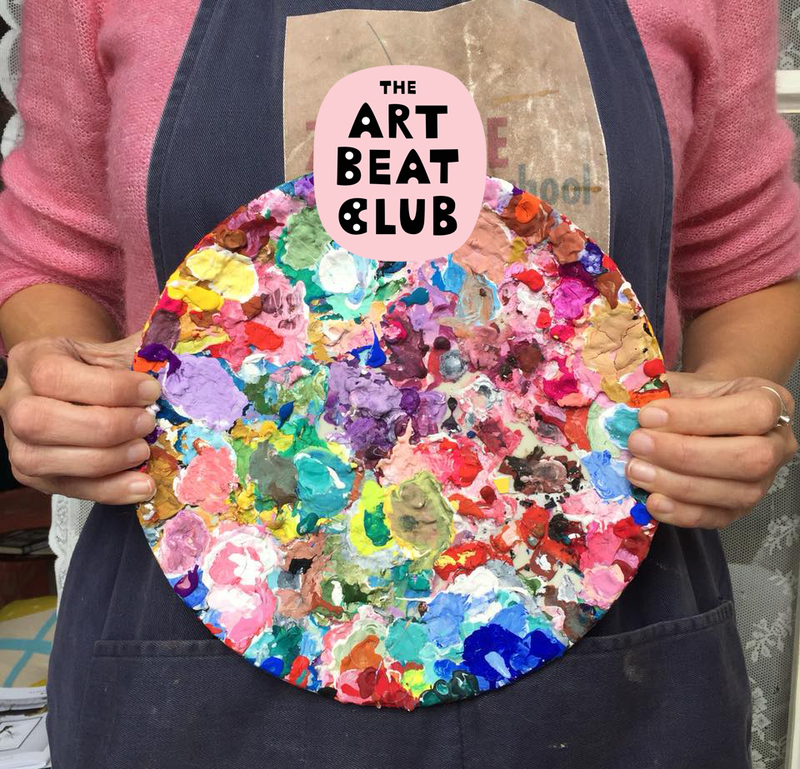 Become a member of The Art Beat Club and receive news, discounts and updates. Most of us are addicted to productivity and fear. We’re afraid of slowing down, letting go of goals and synchronising with Mother Nature. We’re afraid of standing up and being seen. And of confrontation. Particularly women. Fear can lead to stress, tension, anxiety, worry, anger, doubt, obstacles, and frustration: and the remedy? Unhinged creativity! A rich life is filled with meaning, creativity and courage. It’s so important to leave room for stillness, magic and me-time. So here we are. We’re in autumn mode and winter is on its way. The seasons are an abundant tool, guiding us to flow with grace and ease. Nature is getting ready for slow down, rest and renewal. Autumn is about nature; the sky, a low sun, stars, falling leaves, blustery weather, animals, insects and hearty vegetables. Autumn is about being cozy and delicious soups with carrots and beets. It’s the best season for nourishing our own roots and encouraging ourselves, creating space for and connecting with our creativity whilst painting, drawing and writing. It’s time to go inward, reflect and dream. A time to uncover stories. The duskiness wraps her blanket of stars around us and invites us to enter the land of silence and imagination. What creative intentions do you want to plant so you can blossom in seasons to come? Rediscover inspiration, freedom and joy. Learn how to trust your gut and prioritise pleasure. Do what you love and what makes life worth living. We’ll play with paper, pen, paint, words. We’ll combine drawing, painting and a little bit of writing. Step-by-step. You’ll get short practical excercises and live tutorials from Marenthe. You’ll learn how to visualise your inner wonders and how to conquer a white page. You’ll find lots of inspiration in the beautiful garden from Villa Augustus. You’ll use the gifts of the autumn season as creative medicine. Marenthe will guide you with step-by-step exercises and you’ll learn how to build your own visual story. The theme is autumn, winter and ‘what nature brings’. There’ll be some (visual) meditations and room for exploring the lush garden at Villa Augustus for inspiration. On day two, you’ll learn how to bring more magic into your artwork with a small group of no more than 8 people. We’ll dig deeper into the things we did on day one and we’ll spend a full day at Marenthe’s beautiful atelier in the centre of The Hague. Autumn and winter will again be our source of inspiration, combined with the vibrating energy of the city. Marenthe will give you extended personal attention, feedback and guidance. Marenthe will set clear goals for you, which you’ll work on during the day. You’ll get more clarity about how to overcome obstacles, what makes you happy and how to manifest your creativity. Marenthe will tell her personal story about the Global Talent Search, her trip to the USA, Lilla Rogers and working with American clients. You’ll experiment with fresh exercises that will make your Frankenstein brain stop thinking. You’ll gain insight into how to deal with your inner critic and grumpy judge so you’ll feel more freedom to create. You’ll say goodbye to procastination and doubt with exercises and (short) guided meditations. You’ll get more insight into how to use the seasons for inspiration through meditation, writing and drawing. You’ll go home with lots of energy. There’ll be tea and coffee and the cake fairy will visit us. Lunch is not included. You can bring your own lunch or we can have a delicious meal together at the Villa Augustus restaurant (from 8 euros). Please tick the box in the form if you want to reserve a spot for lunch in the restaurant. You will need to pay the restaurant directly on the day. Marenthe will share how she overcame obstacles - doubts, problems and pitfalls, whilst raising two kids and running a creative business. Marenthe will tell you more about the lush new colour trends of 2019 and we’ll experiment with these. You’ll sew the seeds to create a new feeling, a new idea, a new project. You’ll have personal feedback and small group discussions. We’ll work in Marenthe’s atelier in the centre of The Hague. The historical Denneweg, Lange Voorhout and the famous Hotel des Indes (where Roosevelt, Churchill, the Spice Girls and the Rolling Stones slept) are just a walk away and we’ll do a (quick) visit. Tea, coffee, juices, Tony Chocolonely Chocolate, Haagse Hopjes and home-made apple pie are included. Lunch is not included. You can bring your own lunch or we can have a delicious meal together (optional) at Walter Benedict on the Denneweg (from 8 euros). Please tick the box in the form if you want to reserve a spot for lunch in the restaurant. You will need to pay the restaurant directly on the day. Who is the Autumn Art School for? Early bird fee is until October 20, 20:20. Booking will close on November 20, 20:20 (or sooner, once the classes are full). On Saturday we’ll have a larger group, so there’ll be less time for personal feedback and guidance. Marenthe will guide you as a group and if you have questions, feel free to ask them! On Sunday we’ll dive deeper into what we’ve done on Saturday. The group will be no more than 8 people, so there’ll be room for some one to one time with Marenthe. Sunday will feel more like a private class. The locations are different; Dordrecht, day one and The Hague, day two. You’ll get homemade apple pie on Sunday. Registration is confirmed on receipt of payment. You'll receive an invoice by e-mail. Payment within 7 days. You can cancel free of charge within 14 days after registration. In that case, the paid fee will be refunded in full unless this falls on or after November 8. No refunds will be given after this date. Everyone between 18 and 98 is welcome to attend.